Last year cult photography brand Lomography launched a successful Kickstarter campaign for its Neptune Convertible Art Lens System. Initially this featured three interchangeable front lenses (35mm 50mm and 80mm) and two aperture mechanisms (for Canon and Nikon lens mounts). 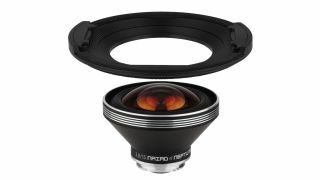 Now Lomography is adding to the range with an ultra-wide full-frame-compatible Naiad 15mm f/3.8 Art lens with a 135-degree field of view. If you're after an ultra-wide lens that produces minimal distortion the Naiad isn't for you, but if you want something a little different in your photographic arsenal it might be. The Naiad’s panoramic design means it lets light enter and curve, so straight lines appear to bend, and the further away lines are from the optical centre, the greater the barrel-like distortion. Lomography reckon the lens will be ideal for street scenes as well as pronounced portraits. Lomography also says the lens will deliver strong, saturated colors and punchy contrast to deliver that signature look the brand has become famous for. The Naiad can focus as close as 1cm from your subject, so there's plenty of potential for some creative framing, while a clever touch is the Naiad’s lens hood also doubles as a filter holder, compatible with rectilinear filters with a maximum thickness of 2mm; the hood also rotates a full 360 degrees. The Naiad is available now from the Lomography shop, priced at $450 / £389 (around AU$580), while it can also be purchased with a lens base (for either Canon or Nikon mounts) for $700 / £599 (around AU$900). Fancy getting a set of filters as well? The Naiad, lens base and a set of four filters will set you back $800 / £689 (around AU$1,050).